Finally, Facebook has resolved the problem with the “Like” button by releasing Reactions, a set of emoticons you can use instead of ‘Liking’ a Facebook post. As you may have read before Facebook was looking to bring new emotions to the platform and had been researching on different emotions and testing them on focus groups across the world since last year. For Facebook it’s a big step forward and it needed to make sure that people liked this change. From now on you will be able to show your friends how you feel about a post. For example if it’s a funny meme you can use the ‘Haha’ emoticon. If someone has posted sad news then you can sympathise with him/her by using the ‘Sad’ emoticon. Similarly other options include Love, Wow, and Angry. Love is signified by a heart symbol while the rest are animated emoji. Those who favour the ‘Like’ button need not feel disheartened as the ‘Like’ button and its associated features will continue to exist. For invoking emotions all you need to do is long press on the ‘Like’ button and the Reactions appear on a small dialog box. The notifications will also change as instead of saying someone liked your post, Facebook will now say that someone has reacted to your post. 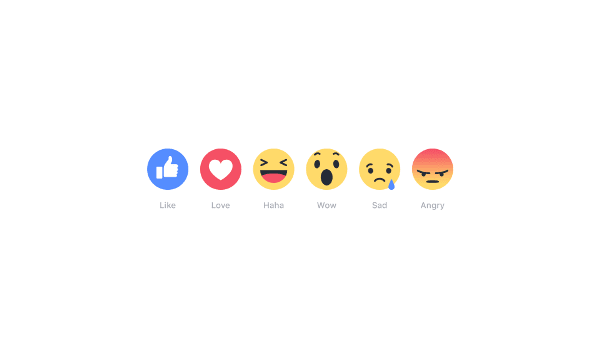 So how did Facebook finally choose these five emotions? That all started with analysing how people commented on posts. Facebook noted that which were the top stickers and emoticons being used to signal reactions to a particular post. They conducted surveys globally asking people which reactions they would like to see on Facebook. The problems with using emojis to signify emotion was that people across the world need to resonate with the same feeling. That is why Facebook had to dump the ‘Yay’ reaction as its meaning was vague in some countries. You might remember that back in October six Reactions had been finalised. During testing the ‘Like’ button earned the most votes and among the new reactions Love stood first. No wonder Twitter changed the ‘star’ icon to ‘hearts’ back in November. Facebook says that it will continue adding Reactions as and when needed by the people in the future. Facebook says that Reactions have started rolling out globally on mobile web, Android and iOS app and desktop versions. If you do not see Reactions then you might have to wait for some time until the changes rolls out to your profile.